Lion Forge Comics is teaming with Stone Village Productions to develop a feature film based on the life of Andre “the Giant” Roussimoff. The story will be based on the authorized graphic novel Andre the Giant: Closer to Heaven released earlier this year. Roussimoff’s daughter Robin Christensen-Roussimoff will consult on the film and assigned the exclusive rights for the biography to producers Scott Steindorff and Dylan Russell. “Andre the Giant rode the wave of the rise of wrestling in America, while suffering from the painful health condition of gigantism; there’s an Elephant Man story here,” Steindorff said in the Lion Forge press release. 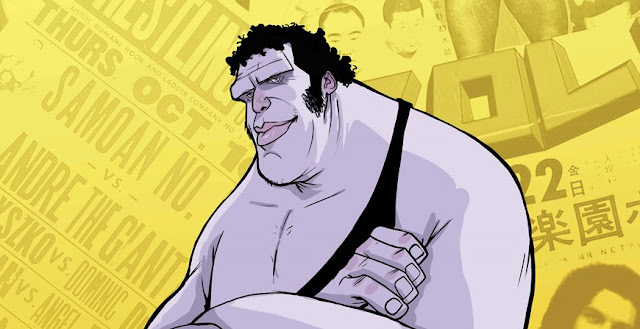 Written by Brandon Easton and illustrated by Denis Medri, Andre the Giant: Closer to Heaven was nominated for the Dwayne McDuffie Award for Diversity and three Glyph Awards. The graphic novel recounts the famed wrestler’s life from his earliest days working on the family farm in France along with the rise of professional wrestling itself, from a global circuit of underground matches to the global phenomenon it is today, due in large part to Andre the Giant’s celebrity. (Read the RD80s review.) It will be republished in a new edition later this month. No time table has been given for the film's production or release.